3DCityDB - Datensätze - HACKATHON - RUNDER TISCH GIS e.V. 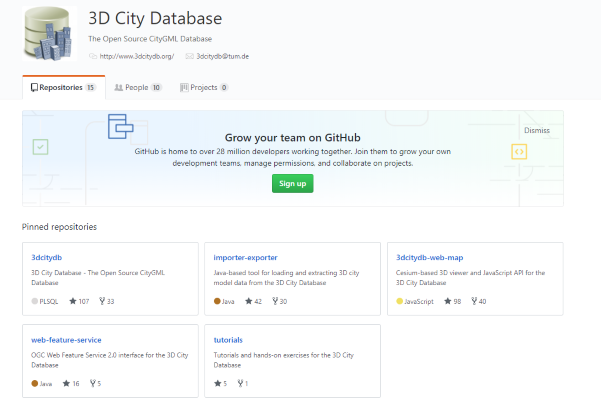 3D City Database is a free geo database to store, represent, and manage virtual 3D city models on top of a standard spatial relational database. The database schema implements the CityGML standard with semantically rich and multi-scale urban objects facilitating complex analysis tasks, far beyond visualization. 3DCityDB is in productive and commercial use for more than 10 years in many places around the world. It is also employed in numerous research projects related to 3D city models. The 3D City Database comes with tools for easy data exchange and coupling with cloud services. The 3D City Database content can be directly exported in KML, COLLADA, and glTF formats for the visualisation in a broad range of applications like Google Earth, ArcGIS, and the WebGL-based Cesium Virtual Globe.